It seems that I got the forecast right for over the weekend, with plenty of fish being caught all along the beach. It seems that the Dogfish have arrived in force, as well as a pack of Puppies. Lots of very small Smoothound have appeared, most of them only being around 5 or 6oz. My mate Paul fished the Chesil Cove end of Chesil and caught loads of Small hounds, Dogfish, Pout, Dabs and a small Bass. He also had loads of Mackerel yesterday afternoon, though they were at range. 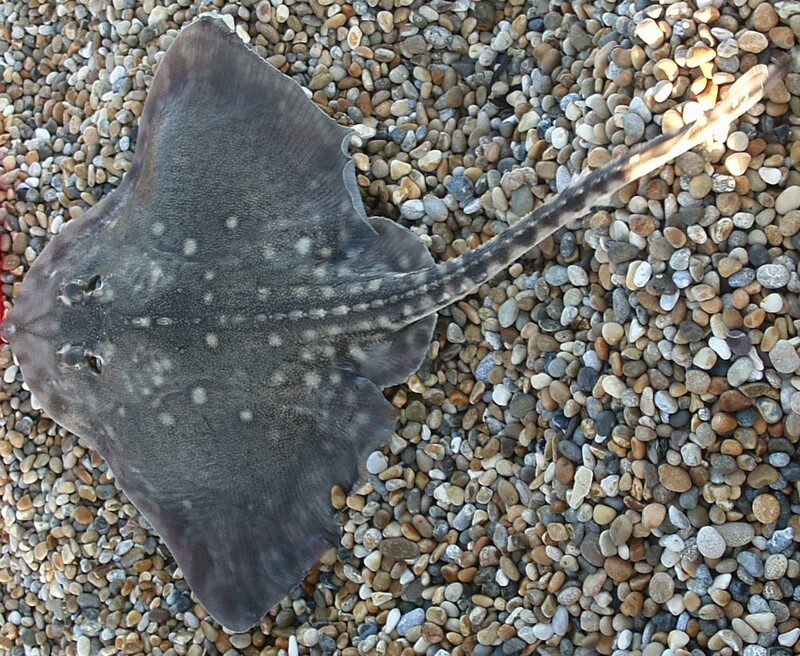 Further to the West between West Bexington and Burton Bradstock, Plaice and Rays were the main catch. Treasurer of Dorchester Sea Angling Club, Duncan Clarke won the club competition fished on Saturday with a couple of lovely Plaice. The largest topping the scales at 3lb 10oz. Other fish caught during the match included more Plaice, Pout, Dogfish and small Smoothound. At last we have a couple of contenders for the April fish on the month competition. Seamus managed a nice Thornback from West Bexington. 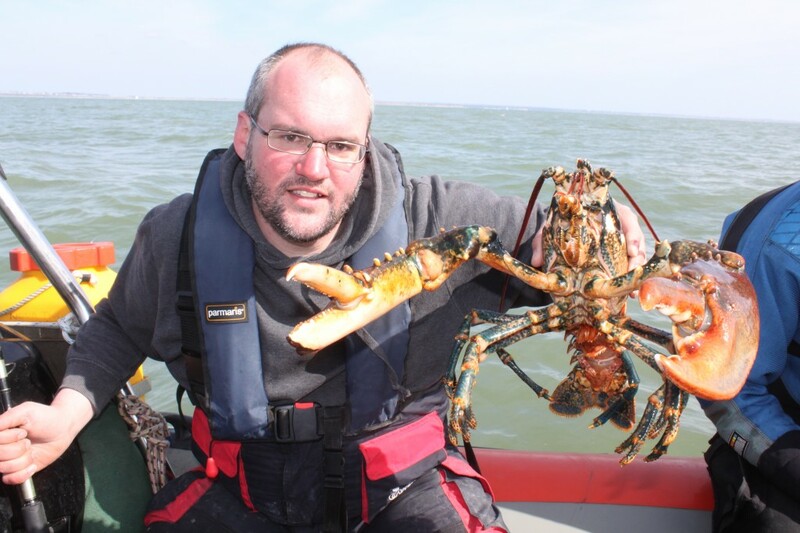 Dave Carpenter had an unusual entry in the way of a 7lb lobster, caught whilst wreck fishing in Poole Bay. I know it is technically not a fish, but I am going to allow it, as the lobster ingested a whole Sandeel on a 2/0 hook. Dave thought he was bringing up part of the wreck when he hooked it. Why does my rod not fit together properly? I just want to share a little piece of advice, especially for novice anglers. I have heard and read quite a few times recently about anglers that have bought new rods. When they have gotten them home then have noticed that the rod does not mate up completely with the spigot at the joint. Rods are designed like that, do not try and sand it down to make it a tight fit. The gap allows the rod to wear over a period of years and still be useable. New content:It will be worth coming back to the site regularly this week, as I have a few changes planed and a couple of new features to announce. I will be adding a new tutorial similar to the Peeler Crab one I did a couple of weeks ago. The new one will be on how to rig Sandeels. That should come out tomorrow or Wednesday, if I have the time to finish it. Chesil Beach: Calm with a 1m swell that built up over night. The water is lightly coloured. Chesil Beach forecast: The dogs are back in town! or at least all along the beach. It is good to see that the normal run of Dogfish have finally arrived. I know they can be a pain sometimes, especially when you are targeting other species at night, but it does meen that everything is going in the right direction. Plenty of Plaice, Dabs and a fair few Rays will be caught from Cogden, West Bexington and Abbotsbury. Mackerel should move ever closer, with the best times normally after 6 in the evening. Remember, only take what you need. We might get lucky and see an influx of larger Smoothound on the beach this week. After the arrival of the pups, I am ever optimistic that some larger adults will show. Live Peeler and Hermit Crab are without a dubt the best baits to use for the Smoothounds. If you use crab then you always have the chance of a Bass or Ray. Portland: I heard of a nice 4lb Ballan Wrasse being caught over the weekend on soft plastic lures from the Bill. A few Pollock are starting to show again, so lets hope it keeps improving. Portland Harbour: Still not much happening in the harbour, but the bait fish and prawns are starting to come in. Weymouth Bay: I was chatting to a couple of guys that fished Preston Beach on an all night sessions from Saturday to Sunday. They managed a couple of small Bass, Flounder, Dabs and some Whiting. Weymouth pier will be a good bet for a few smaller Pout and Wrasse. The Mullet should start to build up again this week as the tides start to drop off. Boat & Kayak fishing: A good weekend for both Kayakers and boat anglers, as they managed to get into fish in the harbour, and for the larger boats, out on the Shambles. I will be featuring a more detailed weekly boat report each week in the future.